Eight thematic packages now available across Ukraine on the EUTELSAT 9B satellite Eutelsat Communications (Euronext Paris: ETL) has signed a multi-year, multi-transponder contract with Media Group Ukraine for broadcasting services on its EUTELSAT 9B satellite. Saudi Arabia’s Taqnia Space (TSC) has signed a multi-year contract with Eutelsat (Euronext Paris: ETL) including incremental multi-transponder wide-beam capacity on the EUTELSAT 70B satellite as well as the fifth HTS spotbeam on EUTELSAT 3B, on which it already operates the four others. Leading global satellite operators Intelsat S.A., SES and Eutelsat announced today that they are aligned on a market-based proposal for the future use of the lower C-band spectrum in the U.S. Eutelsat has agreed to join the breakthrough proposal initiated by Intelsat, Intel and SES. The 8th edition of the DStv Eutelsat Star Awards competition is back following a successful Ugandan edition. Bambu Wireless, a Philippine Telecommunications Solutions Provider, has signed a multiyear contract with Eutelsat Communications (Euronext Paris: ETL) for capacity on the EUTELSAT 172B satellite. Commercialised under the brand BambuSat, the capacity will be used for broadband, maritime, and government services across the Philippines’ 6,000 inhabited islands. 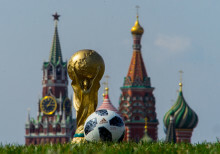 In the final run-up to the 2018 FIFA World Cup Russia™, Eutelsat Communications (Euronext Paris: ETL) announces that capacity equivalent to 5,500 hours of High Definition (HD) transmissions has been booked by several TV channels and service providers ahead of the global event to be held from 14 June to 15 July. Members of the satellite community, including Eutelsat, signed yesterday contribution agreements with the United Nations World Food Programme (WFP), on behalf of the Emergency Telecommunications Cluster (ETC), stepping up their comitment to support global disaster relief.